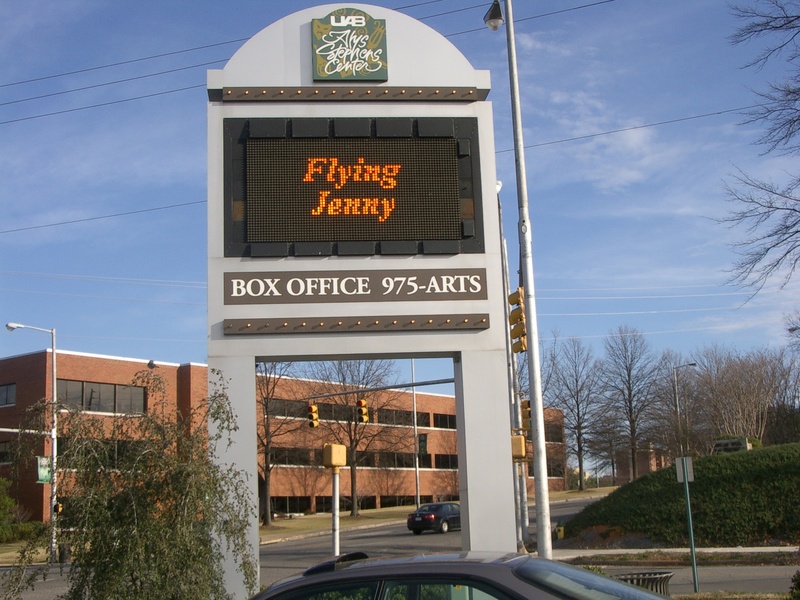 This page will redirect you to the new Flying Jenny web page. Please change your Bookmarks. This one is out of date but we haven't figured out how to get the new one to show up on a Google search. 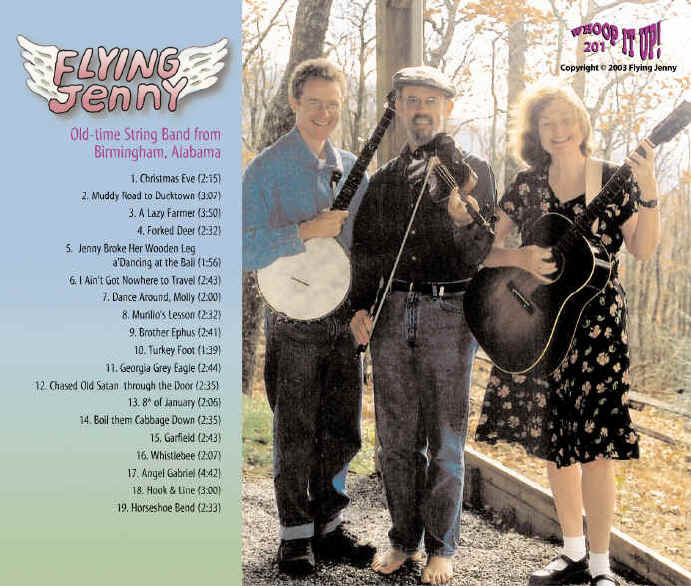 Flying Jenny of Birmingham, Alabama, plays old-time string band music. This was the music of the American settlers from the British Isles and is a forerunner of bluegrass and country music. It consists of lively fiddle tunes meant for dancing as well as old songs sung on front porches and in front of fireplaces when families and friends got together after the days work was done. 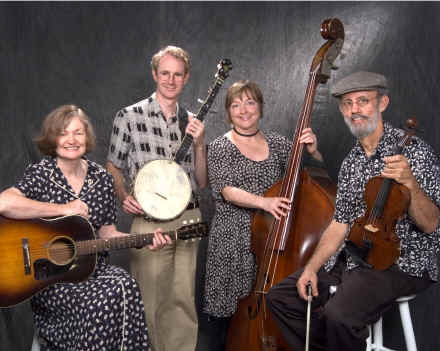 Flying Jenny (named after an old-fashioned mule-powered carnival ride) plays breakdowns on fiddle, guitar, banjo and bass, and sings old songs, often comical, in three-part harmony. In addition to the music, a performance by Flying Jenny includes stories about the tunes and the fiddlers who first played them. They have done a number of thematic performances on such topics as Alabama history, folk art, early radio music, Christmas folk music, romance in old-time music, etc., and have collaborated with storyteller Dolores Hydock in "Footprint on the Sky: Memories of a Chandler Mountain Spring," a piece in which tales, tunes and songs interact with each other to create a sense of life in an Alabama farming community. They have also provided background music for weddings, picnics, art openings and other social events. Duncan Blair plays "clawhammer" banjo, a style that preceded the three-finger bluegrass banjo style more commonly heard today. Besides being a champion banjo player, he is a partner with the law firm of Burr & Forman. The newest member of the band is Rachel Turner, who plays bass. She grew up in Mississippi, the daughter of a Baptist minister, and adds just the right touch to Flying Jenny's old-time gospel numbers. By day she is a dental hygienist. Joyce and Jim Cauthen were (and still are) in another active old-time band, The Red Mt. White Trash, when the Service Guild of Birmingham called them about providing dinner music for a benefit dinner to be held in February 1995. The dinner would have a plantation theme and thus the band must have a banjo in it. Since the Trash did not have a banjo player, the Cauthens contacted Duncan Blair to play with them. Duncan had not been playing banjo very long, but was already quite good and had won first place in the old-time banjo category at the Tennessee Valley Old-Time Fiddlers Convention earlier in the year. Together they developed a long list of tunes to play during the "Guild Gala" and afterwards they decided to continue as a band. In 2003 Flying Jenny added a fourth member of the band, Rachel Turner. Turner, who lives next door to the Cauthens, has listened to them playing on their front porch for 15+ years. Learning to play the bass and sing harmony with the band was a breeze for her. The band took its name from a story that two elderly fiddlers from Sand Mountain told the Cauthens about their first paying job in the late 1920s. They sat in the center of a mule-powered carnival ride called a Flying Jenny, and played tunes for the riders. It was a homemade, portable ride, something like a carousel with benches instead of wooden horses. Each time the ride stopped and folks got off, the owner dropped a nickel in the musicians pockets. The Louvin Brothers got their start on this same Flying Jenny. "A new recording from a homegrown old-time band -- both named "Flying Jenny"-- is an earthy, barefoot delight. . . .The originators have passed away but their legacy shines like the golden image that floats on the folk-art album cover above the heads of the Flying Jenny members. The torch has been passed on, to most capable hands." Flying Jenny seems to be guided by their choice of material, exploring the intricacies and possibilities of each individual piece and allowing those explorations to guide the way. They know when to add the extra little push that makes for a good dance tune like "8th of January" or how to bring out the delicate stateliness of one of those crooked, archaic pieces like "Jenny Broke Her Wooden Leg a'Dancing at the Ball." In addition to being well chosen and played, the material on this CD is well recorded and mixed. I finally get that Stripling Bros tune out of my head about 6 months ago and then Jim hands me a Flying Jenny just as I'm leavin' this weekend...and somewhere around High Springs here comes Horseshoe Bend out of my speakers...sounded so good I 'bout lost conciousness and ran right off the road! I like to broke the "back" button on the dang cd player I hit it so many times...is 100 miles on only one tune some kind of record?" Flying Jenny collaborated with actress/storyteller Dolores Hydock to create musical interludes and background music for her stories about a young woman from Yale University who comes to Chandler Mountain, St. Claire County, Alabama, to do folklore research in the early 1970s. The people she meets and their way of life convince her to make Alabama her home. The stories are funny, sad, nostalgic, and the tunes, so appropriate to the tales, help create a total experience for the listener. Flying Jenny and Dolores are keeping this 45 minute performance in their repertoire for groups that would like to present it. Tannehill State Park, Labor Day Festival, 1995; Jewish Community Center, Birmingham, Summer Concert Series, June 1995; Birmingham Public Library, Brown Bag Lunch Concert, May 1995, April 1996, October 1998; Alabama Humanities Foundation, Meeting of Board of Directors, Jan. 1996 & Oct. 1998; Birmingham Museum of Art, Concert in Conjunction with "Pictured in my Mind" folk art exhibition, February 12, 1996; Southern Heritage Festival, Pickensville, September 1996 and 1997; Kiwanis Club, Downtown Birmingham Oct. 1998; Artburst Concert Series, Birmingham, November 1998, December 1999; Cahaba River Festival, Centerville, April 1997; Indian Springs School Town Hall Concert Series, Jan. 1999; 11th International Conference on Atmospheric Electricity, NASA, July 1999; PEO Statewide Conference, Birmingham, April 1999; Artburst performance with Dolores Hydock, "Footprint in the Sky,' Sept. 1999; Homestead Hollow Crafts Festival, Fall 1997-99;Alabama State Council on the Arts, Arts in Education workshop, July 1998; Alabama Humanities Foundation Silver Anniversary Conference, "Stories Alabama Tells," October 30, 1999; First place winner, Old-Time String Band competition, Tennessee Valley Old-Time Fiddlers Convention, Athens, AL, Oct. 1997,1998, 2000, 2002, 2004; First place winner, Uncle Dave Macon Days, July 2002; Footprint in the Sky performance with storyteller Dolores Hydock, Oneonta, AL, April 2000; Locust Fork Festival, Hayden, AL, May 2000; Music by Moonlight, Outdoor Music series, Dothan, AL , June 2000; Brown Bag Lunch at Birmingham Public Library with storyteller Dolores Hydock, March 2001 and with Herb Trotman and Kathy Hinkle, December 2002; Alabama Sampler Stage of City Stages, 2001 & 03; United Methodist Conference of North Alabama, Birmingham Southern University with Dolores Hydock; Acmar Methodist Church with Dolores; Emmett O'Neal Library in Mountain Brook with Dolores; Samford University Faculty Dinner, September 2002, Outdoor Academy, Brevard, NC, Nov. 2002; Rikard's Mill Festival, Beatrice, AL, April 2003; Gorham's Bluff, October, '03, Pepper Place Farmers' Market. July 2004; Walk As One Walk-a-thon, sponsored by the National Conference for Community and Justice (NCCJ), Oct. 04; Alexander City Arts Council, Jan. 05, Sylacauga Arts Council, Feb. 05; Boom Town Days Heritage Celebration in Fort Payne, Auburn Public Library, Alys Stephens Center in Birmingham., Atmore's Centennial Celebration. Finally! Our name in Lights! April 12: Footmad Dance at YWCA, 7:30 p.m.
April 20: 100th Anniversary Celebration of the Acmar Community Church. 2 p.m. Free and open to the public. Sunday, September 21, 4:30 p.m. Leeds Downtown Folk Festival, featuring John Henry Days. This is a 2-day festival, Saturday and Sunday on the main street of lovely Leeds, 15 minutes from Birmingham. Thursday, November 20: BPL@ Night, 6:30-7:30 in the Atrium of the Downtown Public Library.